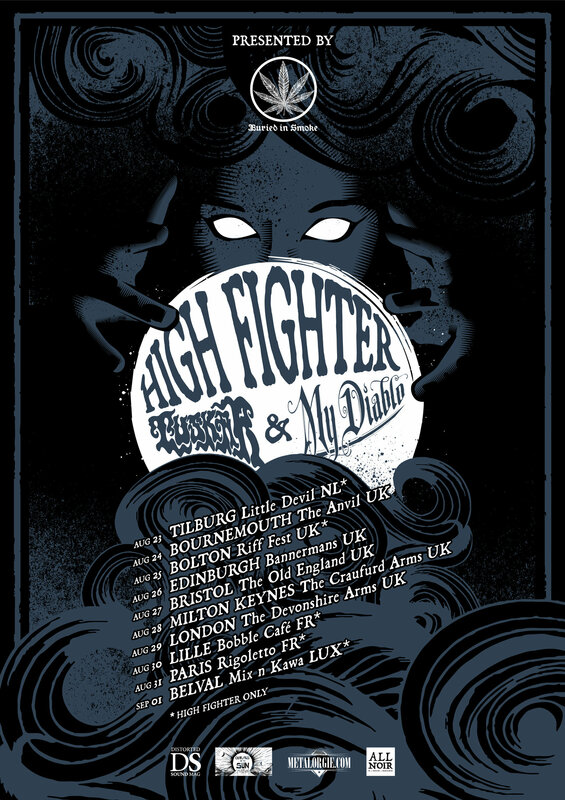 Hamburg-based Sludge & Stoner Metal band HIGH FIGHTER, who just recently announced to return to the UK with support from special guests TUSKAR and MY DIABLO, are about to kick off their European summer tour this week! Beside gigs at Bolton’s Riff Fest and more UK cities, shows in the Netherlands, France and Luxembourg will join the HIGH FIGHTER party. Born in the summer of 2014 by former band members of A Million Miles, Buffalo Hump and Pyogenesis, this band is a volatile cocktail of heavy as hell riffs! Add a heavy dose of the blues and these deadly schizophrenic vocals and HIGH FIGHTER offer something new to the sludge, stoner, doom & metal scene to fuel your appetite with. After their critically acclaimed debut EP ‘The Goat Ritual’ released end of 2014, followed by numerous shows all over Europe including festivals such as Wacken Open Air, Summer Breeze, Desertfest Berlin & Antwerp, Stoned From The Underground, Sonic Blast, Up In Smoke and many more, as well as several gigs and tours with Ahab, Conan, Crowbar, Corrosion of Conformity, Elder, Downfall of Gaia, Mammoth Storm, Brant Bjork, The Midnight Ghost Train, Mantar or Earth Ship to name just a few, HIGH FIGHTER released their first full length album ‘Scars & Crosses‘ in June 2016 with Svart Records. It’s been three years ago since the band toured the United Kingdom while on their first European tour ever back in early 2015. This August, HIGH FIGHTER will bring their latest record ‘Scars & Crosses’ as well as some brand new material live on stage. Beside some dates with Mantar in Germany this summer, it will be one of the last tours HIGH FIGHTER will play this year and before they are going to release their second full length album in early 2019. Heavy psych rockers SAMSARA BLUES EXPERIMENT stream new album « One With The Universe » in full ; Euro tour kicks off next week! London’s party doom heroes GURT share new video « Broken Heart Heroin Man » on Kerrang! ; new album « Skullossus » still available! Heavy metallers HIGH REEPER share wild new video ‘Bring The Dead’ ; album coming March 22nd Heavy Psych Sounds Records!